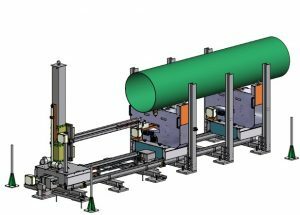 The PIPE SCANNER system is designed to perform a complete and accurate radiometric scan of the internal and external surfaces of a pipe, tube, or similar conduit, e.g. coming from decommissioning of Nuclear Power Plants. The measurement cycle is totally automatic, carried out by the PLC sequences, which are managed by the software installed on the host PC. After loading the pipe the system runs a series of preliminary tests through optical devices: actual diameter and length measurement, and roughness check. The pipe is automatically divided into portions to be scanned by the detectors, according to its length, and for each section, the system acquires the radiometric data. The system can also detect “hot spots” of contamination. At the end of the scanning, a report is produced, with the reading of the surface contamination. Safety devices and a perimeter infrared barrier prevent any dangerous man/machine interaction. The plastic scintillators are installed by pairs in the tip of two poles, mounted on a support vertical column. The detectors in the two poles face each other, in order to “see” both the pipe’s surfaces, internal and external.